Last night, on the under-card of Tony Bellew’s fantastic KO win over the dangerous Ilunga Makabu, heavyweight contender David Price returned to winning ways. Fighting for the first time since his July 2015 KO loss to Erkan Teper – who subsequently failed a post-fight drugs test and was banned from boxing – 32-year-old Price made short work of Czech Republic heavy Vaclav Pejsar. 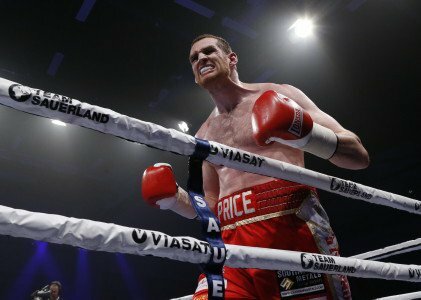 Price decked the 9-2(8) 31-year-old in the opening round and finished the job in the 2nd. Pejsar is no top contender, but he had never previously been stopped and he had won his previous four fights. Price, now 20-3(17) and working with new trainer Dave Coldwell, dwarfed Pejsar and he obviously needs bigger tests before fans are able to judge whether or not he has a realistic chance at making it to where he wants to go, which is to the very top. Price wants, and deserves, the lofty world ranking he had prior to “being cheated” in the loss to Teper (Price’s earlier loss to Tony Thompson also came to a man who later failed a drugs test) and if he is reinstated as the #5 IBF heavyweight contender, he says he would love a shot at IBF heavyweight ruler Anthony Joshua. Seemingly every active heavyweight anywhere near the top-10 wants and is asking for a shot at Joshua, and Price may not get a look in. The fight would, though, be a clash of big names (in the UK) and big punchers But would Team-Joshua look at Price as all risk and no reward? If he were to defend his belt against Price and blast him out in quick fashion, the critics would say, so what, due to Price’s previous three losses (even if there is a cloud hanging over them and Price claims he would not have lost had Teper and Thompson been clean) – while if Price tagged Joshua with a big shot, who knows? For now, it’s good to see the likeable Price back and winning. Having bulked up in training whilst he’s been out of the ring, the giant looks even stronger than before. But how will that chin hold up if and when it is tagged by a big punch?